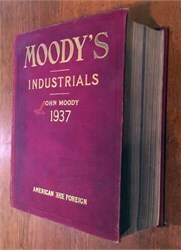 Moody's Industrials - 1937. Hardcover. Good. Complete but shows signs of light wear. 11.5" x 9". Stocks, Bonds, Debts, Cost, Traffic, Earnings, Expenses, and Dividends, their Organizations, Directors, Officers, etc." 3243 pages of great reference material.